The exhibition "Resonance" was initiated in early 2010 as an experiment in the conceptual underpinnings and practical manifestations of sound art as a genre and form in contemporary greater China. Growing out of a series of readings and conversations in Hong Kong with artists as varied as Yan Jun, Feng Jiangzhou, and Zhou Risheng, the final exhibition program included two installations by artists Samson Young, an artist and composer based in Hong Kong, and Yao Chung-Han, a sound artist based in Taipei. This selection of artists allows the experiment to step beyond the mainland sound art and experimental music scene, which is largely incoherent in its current free-for-all exploration of new sonic forms--a site of artistic freedom indeed, but also a difficult territory in which to reflect on the modes of sound already in use in the contemporary art community. Samson Young contributed a piece entitled Beethoven Piano Sonata, nr. 1 - nr. 14 (Senza Misura) (2010), a series of open circuit boards hung in rows on the gallery wall. Each board houses two LEDs and a speaker, each marking the tempo of a single movement of fourteen of Beethoven’s early piano sonatas. In the second gallery room, Yao Chung-Han installed an audiovisual piece entitled I Will Be Broken (2010), a suspended column of circular fluorescent lamps tied together with power cords that illuminates in a semi-random fashion and emits a prerecorded sequence of sounds. The two pieces engage in a dialogue of light and sound that confronts the tension between sound as aesthetic spectacle and sound as conceptual material, opening a productive conversation between styles and historical developments in the trajectory of sound in art. "Resonance" is on view at I/O Gallery in Hong Kong until September 5, 2010. Robin Peckham (RP): I’d like to start with our initial thoughts when we set out to put this exhibition together. We were interested in how different cultural labels, specifically including music, experimental music, sound, and sound art, are distinguished in the Chinese context. During curatorial projects in Beijing and Shanghai, we found that artists and musicians working under these different labels all share the same live performance events and even exhibition contexts. I want to ask how the two of you see yourselves fitting into this system personally, and how you have experienced these distinctions in Hong Kong and Taipei respectively. Samson Young (SY): In Hong Kong there is a circle of people working with, writing, and playing classical music, and that’s a very specific and self-contained scene. Then there’s a set of people outside this scene who also share a series of different and unrelated events, such as William Lane of the Hong Kong New Music Ensemble and myself. We both come from classical music backgrounds originally, but we’re also involved with other things, learning from different kinds of artists and musicians. The scenes are defined but the content of the work produced in each of these circles is not. As for defining my identity in all of this, I don’t have any strong feelings in terms of being a certain kind of artist working within the territory of sound art. I come out of the classical music world, but I make work that might function as contemporary music in the concert hall or something else entirely within the gallery context. No matter what the work is, it should be evident that my interest lies in a certain set of ideas of music to some degree or another. I tend to resist being labeled as a sound artist because this term is so ideologically and politically loaded. There are so many problems with it that have yet to be resolved. Its aesthetics are still being defined, particularly the question of how to judge a work of art within this territory. The question is very much still under discussion. That’s one problem. The question of how to judge or test a work of art is often mixed up with this other question of “what is sound art,” where these should be very separate questions. A work might emit sound of some sort of sound in a gallery setting, but the strategy of judging it through the criteria of sound rather than as conceptual or visual art is a very political process. It is a value judgment. It is very dangerous to judge the work within or using these unresolved debates over the nature of sound art, because it introduces all kinds of ideological questions. The discussion of aesthetics and the discussion of the identity of sound art should be separated. But now they exist within the same conversation, mixing the idea of a value judgment from the idea of a judgment of quality. We have a conversation and a discourse over these questions, but no sense of definition. If we introduce the question of “what is art,” then the entire project becomes compartmentalized and limited to its own territory without any further possibility of the expansion of the genre. As for how I define my own work, I will do some things within the gallery setting with the materials of sound and music, and people can label it as they please. But I don’t think I’ve answered the question. RP: Yao, I have a more specific inquiry for you. My understanding of the Taipei sound art scene is derived from this narrative of Lin Chi-wei and his collaborators, particularly the Zero and Sound Liberation Organization of the 1990s, which was very much influenced by DIY and punk ethics and aesthetics in music and later art, while on the other hand today we have artists working in a vernacular influenced more by international new media, like Wu Chi-tsung, Wang Chung Kun, and Tseng Wei-Hao. In practice, how do these scenes overlap? Which of these artists do you commonly work or exhibit with? Yao Chung-Han (YC): In Taiwan, sound art has actually already been very clearly defined, or at least categorized, starting from Lin Chi-wei and on towards Wang Fujui, and then to us. Because we all come out of similar art academy backgrounds it appears as a very clear lineage from the outside, a certain school of sound art. The other major school emerges from the academies of music, working with more musical styles of production. Those are the two major directions. Both schools work with new technologies. Younger artists in both have become accustomed to using computers in their work, and both occasionally use musical instruments. RP: You work in a collective called i/O Lab (no relationship to I/O Gallery). Who is involved in that group? YC: Me, Wang Chung Kun, Chan Ming-Fang, Chang Yung-Ta, Huang Chung-Ying, and Yeh Ting-Hao. RP: Do you all work in this more conceptual tradition of sound art, or do you also move into the areas in which Samson works, like composition or performance? YC: More conceptual. It’s production. Our material is conceptual and the result should be thinking, with other relational and spatial concepts as well. In terms of composition, I think some of us make attempts occasionally, but our backgrounds are all in technology and art. Wang Chung Kun’s background is in sculpture, with a bit of architecture for some of us, but the other members are all working in some type of art or design. No one is trained in music. RP: If we look specifically at the two pieces of work included in this exhibition, would you say that sound functions as a medium or a material here, or something else, some other concept? SY: In my work, the concept is a musical one, but it emerges with a different function, as something closer to sound. 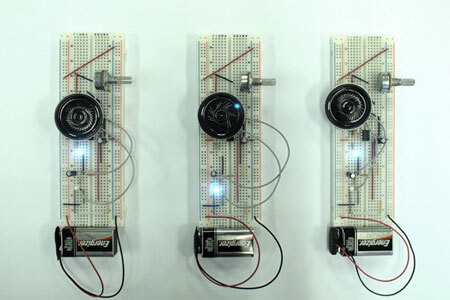 The project contains 14 devices, each of which is playing the tempo of a single movement of Beethoven’s early piano sonatas, just as would a metronome. I am interested in this because self-proclaimed sound artists often have at least one shared point, which is that they understand that the definition of sound art is currently being determined. They understand that this is a fluid process, so the term sound art functions more as a signal of a certain territory. But on the other hand, they understand exactly what music is and what it does. From our academic training, we’ve learned that music is not a fluid space, but oddly sound art uses music in its own process of self-definition, as an antithesis of sorts. There is a reactive method that is used to understand sound. So here I’m using something from music that could not possibly be more canonical, and then reducing it to something that could possibly be accepted within the territory of sound art. I want to see what happens through this gesture. It’s an experiment. RP: Yao, what do you think in terms of your work? YC: My work employs the relationship between sound and light as a catalyst for conceptual work, so I would say both of these elements function as materials. In the process of production I’m trying to tease out something more obscure through this relationship. RP: So what role does sound play there? What is it doing? YC: It is a point of origin for the concept of the work. Ultimately it is only a portion of the final piece, but it plays a very important role. RP: Both of your works involve light in addition to the sound component. Why did you make the decision to include lighting elements for this kind of work that explores the nature of sound? Is there a necessary relationship between light and sound? Is light included for primarily conceptual or aesthetic reasons? SY: After I had determined the concept, I thought of how to make something like but unlike a metronome, based on György Ligeti’s work, with all of the metronomes swinging back and forth. A piece of music traditionally has a beginning and ending, a structure, and isolating the tempo collapses this composition. Ligeti’s piece depends on both sound and movement. Putting together all those metronomes might not necessarily be mesmerizing per se, so what I wanted to do was to make something very visually mesmerizing. So I added these LED lights that blink with the tempo. It brings together the visual piece as a unified whole. The sound and the light both have the same function here. Without beginning and ending it becomes a mesmerizing loop. I wanted to preserve that collapse, but make it even more obvious. RP: Yao, the relationship between light and sound in your work comes from a very different place. Without light you simply wouldn’t have sound. Is there a conceptual difference there as well? YC: At the beginning I was experimenting with lights in my studio process. We’re so inundated now with audiovisual work, from performance to media, and I wanted to experiment in a way that was related to that. I was interested in the role sound played in the audiovisual, especially in the kind of musical performance that Alva Noto and that whole genre is working with. Why, in the information environment we live in, are we interested in that style of work? I think there’s actually a very artificial relationship between sound and light in many cases, so I became interested in more natural, more determined relationships, as with the physical properties of sound and light, and especially cases where the two are inextricable. That scenario is very different from our normal process of audiovisual design. RP: In the early stages of discussing this exhibition concept, one of our theoretical points of departure was the recent work of Seth Kim-Cohen, who has been advocating a “non-cochlear sound art” in the tradition of Marcel Duchamp’s “non-retinal art” and in a sort of opposition to John Cage’s “sound-in-itself.” That is to say, he calls for a cognitive rather than aestheticized sound art, the kind of thing you might not even hear at all, or that might involve more conceptual elements. I think this is an interesting but somewhat unfashionable position to take now, after the visual or experiential turn of the last decade, though perhaps this applies to a lesser degree in new media circles further from the art world proper. But there is room for fascinating relationships between sound, the visual, and the conceptual that emerge in this new space. What do you think of these developments? Can sound art be pure sound, or does its status as art imply a necessary conceptual content? SY: According to my understanding of John Cage’s sound-in-itself, I think he had his own agenda related to the heyday of European musical modernism and his advocacy of pure sound has to be seen within that context, even though that context no longer exists. Musical modernism has passed. Sure, Cage was a pioneer of sorts, but we also have to put him in his historical place. He was not just a bombshell dropping out of nowhere as he is often treated when we cite him today. That’s the important part of this question. Music has never even been about pure sound, much less sound art. When I go to hear classical music I never spend much effort listening, but rather spend most of my time watching the conductor. Music was once live theater. Until the recording, there was no such thing as disembodied sound, no such thing as sound without the visual. I think if we reframe the question of “non-cochlear sound art” keeping this in mind, the answer becomes simple. When I write concert music I’m always taking into account different factors, including vision, light, interactivity, and so on. That’s a specific position towards the creation music. Within the gallery, we’re working in a different economy of circulation, but the position towards sound and the visual can be similar. RP: For those of us with less of an understanding of the historical development of the contemporary music world, would you elaborate a bit on the passage of musical modernism? SY: John Cage’s reaction against musical modernism was indeed a form of liberation, in terms of defining sound-in-itself outside of music, separating sound from the concept of music. He also liberated notation, assuring that without notation there could still be a sonic context. Finally, he assured that music need not happen only within the concert hall. It no longer needs to rely on the economy of the concert hall. After this, the movement of the avant-garde within and beyond the concert hall could function similarly, even if Cage tried to throw off this balance even further. Most significantly, the social context of the European tradition out of which all this emerged no longer exists. YC: Studying with Yao Dajuin, we learned to work with sound and nothing else. But the question of the audiovisual within and in relationship to sound is important for me, so I work more with modes of perception in order to analyze forms of communication between these different elements, especially communication with the audience. This communication, as reflected in my work here, is not simply audio plus visual, but rather explores a very different set of reactions that take place when these two things combine. The object in the exhibition space plays a very specific role, based partially on its physical properties. I’m working with the spaces in which these different forms of communication adapt to each other. RP: I feel that much of your work, and this piece in particular, is more about a visceral relationship with the body, not simply audiovisual but also physically present in terms of tension or even fear produced by the combination of sound and light. Is there a difference between this kind of relationship and more cognitive approaches to sound? YC: It’s arousal, or excitement. This is a simulation of the sphere of mediation in which we live, populated with familiar objects and abstractions of the light and sound that inundate us. This is more direct, based on minimal and installation art rather than musical sound. It does not require too much contemplation, but rather enacts a different form of bodily communication within this sphere of media and information. Those pieces of information in the real world carry specific meanings, whereas when they are deprived of meaning we are pushed into a state of anxiety, a new model of communication. I’m interested in the reactions to this uncanny form of communication that does not respond to cognitive interpretation, but rather to direct experience. RP: Your work contains a sensor such that when someone walks into the space there is a very specific order in which lighting elements become illuminated in relationship with the recorded sound of the piece. How is this order defined? YC: The sound is intended to complement the “motion” of the lighting system, and the order of illumination is randomized according to the physical properties of the hardware. I’m interested in the moment of uncertainty in which even I don’t know if a given light will illuminate. It depends on temperature, voltage, and so on, and these factors inform the soundtrack. It’s like looking at the ocean. You can see the light moving over a given surface area of water and it appears as a random or abstract motion, but in reality it’s all determined by the physics of light, water, and reflection. It’s a partially intentional and partially incidental composition. A performative process. 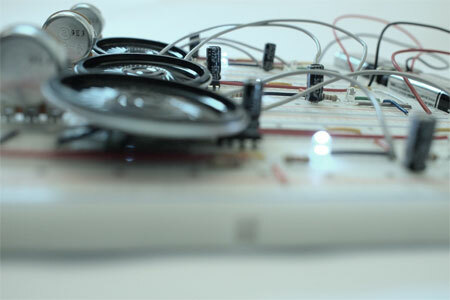 RP: Have you ever worked with generative or algorithmic processing in your past projects? YC: No. I don’t see any point to Max/MSP style processing. It’s an abdication of the responsibility or control of the artist, and doesn’t add any of the interesting elements of the physically randomized processes I described in relation this piece. RP: This is something of a problem in the Chinese sound art scene now, and one of the things that made the exhibition concept so interesting for us. The ideas some of these artists start out with are often very interesting, but randomized processing without any aesthetic control is no substitute for turning a given observation into art via more proactive methods. The results often look awful in the exhibition space. There is always this question: why do you want to randomize this particular subject matter? What does generative processing do for this particular field recording? And that leads back to the question of non-cochlear sound art, because there’s certainly little of aesthetic interest there, only conceptual, but does it make for interesting art? What kind of conceptual standards are we applying to the aesthetics of sound? 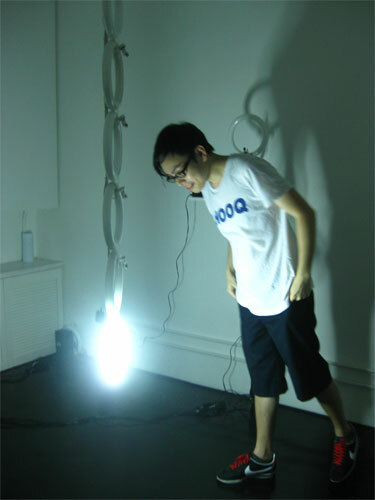 Yao Chung-Han: Born in Taipei and a 2008 graduate of the School of Art and Technology, Taipei National University of the Art, Yao Chung-Han is an active member of the new generation of sound artists in Taiwan, which includes the group i/O Lab of which he is a core member. His works are mostly concerned with sound, while at the same time searching for the inherent connections between video, installation, space, and various media. Recent exhibitions include Non-Places: Architecture of Pheromonal Presence, SCU, Taipei (2010); Emergencies!014, NTT ICC, Tokyo (2010); Tokyo Story, Wonder Site, Tokyo (2010); SuperGeneration@Taiwan, Today Art Museum, Beijing (2010), and Shanghai Art Museum, Shanghai (2009). Samson Young: With formal training in classical music and a keen eye for visuals, spatial installations and new technologies, Samson Young has been known to combine his diverse interests into uniquely intermedia concert experiences. Beyond the classical concert stage, his creative output spans composition for symphony orchestra and live electronics to amusement ride-turned-interactive installation and multi-channel performance video. Recent exhibitions include: 18 Degrees of Acclimation, White Box Gallery, New York (2010); Beyond the Colony of Kitsch, Crossing Art Gallery, New York (2010); Hong Kong Biennale of Urbanism and Architecture, Hong Kong (2010); Prospectives International Festival of Media Art, University of Nevada (2009); and Last Intervention, Osage Gallery, Hong Kong (2009). Robin Peckham: A writer and curator based in the Pearl River Delta, Robin Peckham is currently researching localized international rhetoric of abstract painting. A founder of the Society for Experimental Cultural Production, he was previously affiliated with major commercial space Boers-Li Gallery, pioneering alternative space Long March Project, now-defunct performance art venue Hart Salon Center for the Arts, and landmark sound and music venue What?!. He currently contributes to publications including Yishu, LEAP, Artforum.com, Redbox Review, Arttime, and ArtSlant, in addition to editing and translating critical volumes and exhibition catalogues on artists and architects across greater China. and instead we live in the ideal and fantasy of what Summer becomes. We anticipate this time of year with a child like earnestness and we willfully throw ourselves into a haze, from which we slowly find our way back into reality.